Let’s get the elephant in the room out of the way first. Russell Crowe is in his mid-forties and playing the “younger” Robin Hood — you know, as is the trend these days to show us how the men became the legends. He’s utterly mis-cast in the role. Being such a chameleon of an actor in his younger days has taken its toll on Mr. Crowe, and he hasn’t aged well. He’s reached that point in his career where he now only plays Russell Crowe — you know, that bullish, overweight, talented dude full of piss and vinegar on and off the screen. Thankfully, his old pal Ridley Scott still loves him, and you have to give the director some props for not giving a damn about the age thing (hell, Sir Ridley is in his seventies himself) and casting ol’ Russell in the title role of his revamp of Robin Hood. He then had the good sense to cast (shouldn’t she be Dame by now?) Cate Blanchett as a feisty Lady Marion, and for fans of old school Hollywood epics, it’s a real treat to see two accomplished Oscar winners create palpable chemistry and act against each other within the comfortable context of well-worn characters. Ridley Scott has traversed many genres, but he — more than any director out there — knows his way around historical epics. Let’s not forget it was his first marriage to Russell Crowe in Gladiator that brought the two their biggest hit — and deservedly so. His Robin Hood (though I already can imagine a bloated director’s cut coming to Blu-Ray) is surprisingly quick-footed. 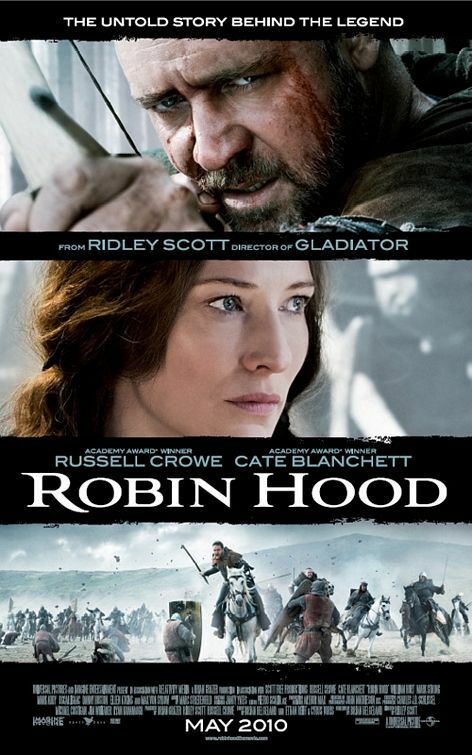 Well paced and edited with meticulous attention to period detail, beautifully photographed, and featuring a well done by-the-numbers script that adds just enough psychological background to the characters, good humor, and politics for viewers to become invested in the retread of the legend, Scott’s Robin Hood arrives better than advertised. It’s also great to see Scott learned from the one big mistake he made with Gladiator, where he relied to heavily on CGI to color in ancient Rome, and instead here leans on spectacular set pieces (the castles are extraordinary) and the natural British scenery (get a load of this Sherwood forest) to takes us back in time. If there was any CGI used here, I couldn’t tell, and that’s a true sign of a top-notch crew. When a film costs an obscene 200 million dollars to produce, it’s refreshing not to be insulted with shoddy production values and laughable effects. While the two mega-star leads are up to the task, it’s usually the supporting cast that can make or break these types of overwrought epics. Thankfully here they handle their task with aplomb with Danny Huston appearing all-too briefly but like gangbusters as King Richard the Lion-hearted, Mark Strong making an excellent French-talking bad guy, Oscar Isaac over-acting Joaquin Phoenix-style as Prince John, and Eileen Atkins superb as the queen mother. Eh, yeah, I guess I was entertained…again. Don’t go in expecting anyone to reinvent the wheel and you might have a good time in this Hood. If the previews in front of the film are indicative of the tripe coming our way this summer, we should be thankful something like Robin Hood came around in May. It’s a film that comfortably is what it is: generic but pretty damn good. This entry was posted in Movie Reviews, Movies, Pop Culture and tagged Archery, Cate Blanchett, Danny Huston, Eileen Atkins, Gladiator, Great Britian, Historical Epics, Lady Marion, Legendary Characters, Mark Strong, Oscar Isaac, Prince John, Richard the Lion-hearted, Ridley Scott, Robin Hood, Russell Crowe, Sherwood Forest. Glad to see you got something out of ROBIN HOOD, David. I will admit it did have it’s moments. Scott’s work seems to be all over the map. I still need to see Gladiator, Black Hawk Down and quite a few others but of the ones I have seen I would rank Alien and Blade Runner at the top followed by American Gangster, Thelma and Louise, Someone To Watch Over Me with two terrible films, Body of Lies and A Good Year bringing up the rear. Ha!,just realized I left off ROBIN HOOD which would fall right after SOMEONE TO WATCH OVER ME. I enjoyed Robin Hood. It doesn’t reach greatness but certainly, it was entertaining. It is quite odd how divisive this movie has been as some people absolutely abhorred it while other thought it was good enough.